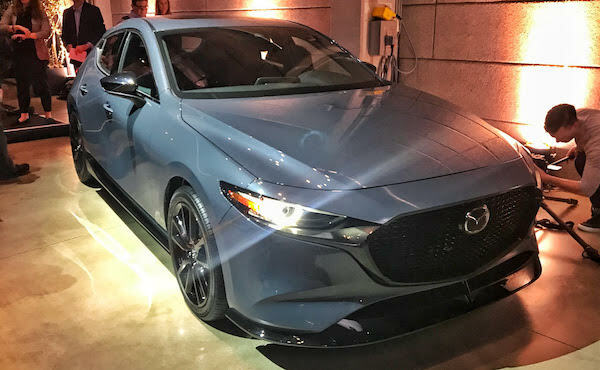 Mazda showcased its new generation of Mazda3 compact sedan and hatchback at the 2018 Los Angeles Auto Show while detailing the myriad modernizations made to the forthcoming model. The automaker emphasized that the redesigned Mazda3 was engineered with the philosophy that everyday driving can and should be fun, but without sacrifice to practicality or sustainability. To that effect, the Mazda3 utilizes a novel chassis design system as well as technologically advanced powertrains, all encased in an evolved version of Mazda's Kodo design language, as informed by the 2015 Mazda RX-Vision concept car. Mazda enhanced its "continuous ring structure" chassis design for the Mazda3's unibody, stiffening the frame to make better use of the suspension and tires. The former are comprised of MacPherson strut fronts and torsion bar rear, and the latter of either 205/60 tires on 16-inch wheels or 215/45 tires on 18-inch wheels. Mazda made sure that the A-pillar was shaped and positioned for minimal obstruction of the driver's view of the road, which can be fine-tuned with a highly-adjustable, contoured driver's seat. From there, the driver can manipulate an eight-speaker sound system, provided they aren't busy rowing gears in the Mazda3's available six-speed manual transmission (a six-speed automatic is standard). These transmissions will be linked to a variety of engines, including the 1.5-, 2.0-, and 2.5-liter SkyactivG dual-injection engines, the 1.8-liter SkyactivD diesel, and the star of the show, the ultra high-tech SkyactivX, a supercharged 2.0-liter engine that uses spark-assisted compression ignition to catapult power and efficiency skyward. Power flows either to the front or all wheels with Mazda's i-Activ all-wheel-drive, though which drivetrain combinations will be available is uncertain—Mazda doesn't allow free mix-and-match of the best powertrain options on the Mazda6, so it's not yet certain that AWD, a manual transmission, and SkyactivX are available together. 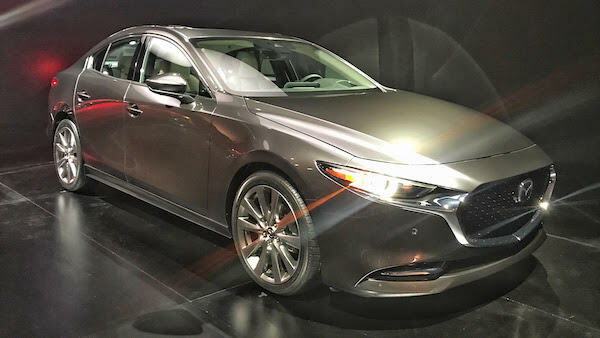 Mazda confirmed to The Drive that AWD will be available on both body styles, though SkyactivX will not be an option at launch, and only the 2.5-liter SkyactivG will power the car on day one. A company spokesperson stated that powertrain configurations have yet to be finalized. Tech of today is in no short supply in the Mazda3. Its owners' manual moves to an app linked to the car, which will alert the driver through their phone the severity of dash warning lights when they come up. Yaw-sensing brake vectoring keeps the car nimble but also stable at all speeds. Sensors watch the driver's eyes to determine levels of concentration and fatigue. Blind spot watch and brake assists prevent accidents, and on some models, active cruise control manipulates the throttle and brake to automate traffic jam passage. Keep an eye on The Drive for more updates on the Mazda3 and Los Angeles Auto Show as we provide boots-on-the-ground coverage of the event.